Do you want to know how to get to the gimpo airport (GMP)? There are many ways you can get to gimpo airport (GMP) such as public transportation (bus, subway / metro), taxi and Blacklink limo/transfer/shuttle service. Don't sweat outside waiting for other transportation with your luggage. Make a round trip reservation with Blacklink as you plan for your trip. It is easy, convenient and available 24/7. Then, the assigned Blacklink driver will greet you at the arrival and will drive you to the gimpo airport (GMP). You can use Blacklink for not only hotel but also Gimpo Airport (GMP), Myeongdong, Jongno-gu, guesthouse, resort, airbnb, lodging and anywhere you want to go in Korea. Check out Blacklink customer review posted below. Gimpo (Korean pronunciation: [kim.po]) is a city in Gyeonggi Province, South Korea. It borders Incheon, with which it shares the South Korean side of the Han River estuary, as well as Seoul and the lesser cities of Paju and Goyang. North Korea is across the Han River. The current mayor is Young-Rok,Yoo. The city's population of more than 300,000 is made up of more than 71,000 households. 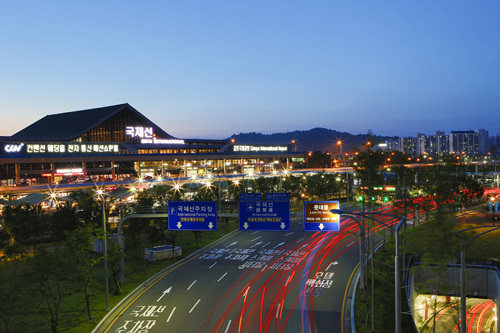 Gimpo Airport (formerly Kimpo International Airport) used to be located inside the city, but is now part of Seoul. Tertiary educational institutions located in the city include Kimpo College and Joong-ang Seungga University. There are 27 elementary schools, 12 middle schools, and 8 high schools, including Gimpo Foreign Language High School. Three elementary schools, two middle, and two high schools are located in the area of Tongjin.